In a large sauce pan, melt 2 tbs of butter over medium heat until frothy. Add chopped asparagus to the pan, stir slightly to coat asparagus with butter and cover with the pan with a lid. The asparagus should be slightly damp when adding it to the pan. The pan should only be on medium heat so you don’t burn the butter or the asparagus. Cook for 4 to 5 minutes – depending on thickness of asparagus. 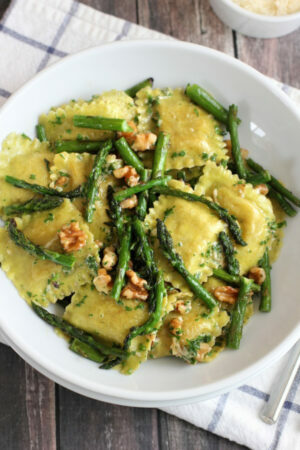 Add walnuts, parsley and 2 tbs parmesan cheese – toss gently to combine.